UVic Libraries has a long history of working with community partners to bring new collections—of value to the community and researchers alike—into being. 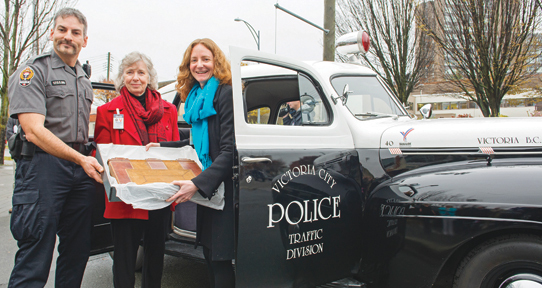 One initiative was digitizing 19th-century charge books from Victoria's police department. At UVic, we know that a commitment to civic engagement, getting involved in the life of communities in order to make a difference, and the benefits of real-world experience aren’t values bestowed at graduation. They’re integral parts of the learning process, starting right where we live and learn. We’re serving our community through academically rigorous programs that enhance learning, and through the wide array of student-driven initiatives that address our society’s needs. UVic and the community are brought together through shared goals, service and activities. UVic is recognized as a national leader in community-university engagement. It is a core value at UVic and is embedded in many activities across our university through teaching, research and a vast inventory of community-focused initiatives. Since 1999, CanAssist's interdisciplinary team of students, researchers, faculty and staff has worked with community members around the world to design, build and modify assistive devices for people with disabilities. The CanAssist team is providing individual solutions and technologies that have attracted national and international recognition, giving students meaningful hands-on learning experiences with direct impact on the quality of life of the people they work with. The Centre for Outreach Education (CORE) is a multidisciplinary centre developed by the Faculty of Education. CORE's mandate is to enhance the education of children and youth from local communities whose learning and assistance needs extend beyond the services offered by schools and current government programs. Canada’s first Research Partnerships and Knowledge Mobilization (RPKM) unit supports research collaborations with business, government, community organizations and other academic institutions. The UVic Speakers Bureau is a free community service provided by volunteer speakers from among the faculty, staff, graduate students and retirees who teach, conduct research, study and work at the University of Victoria. Through the bureau, experts and knowledgeable individuals from UVic make themselves available to speak to community groups, schools, clubs and other organizations throughout Greater Victoria and southern Vancouver Island. University 101 provides introductory academic courses in the humanities and social sciences to people whose economic and social circumstances normally pose obstacles to university education. The program feeds the quest for knowledge among underserved groups. Meals are provided at the beginning of each class. Bus tickets and child care subsidies are also available.